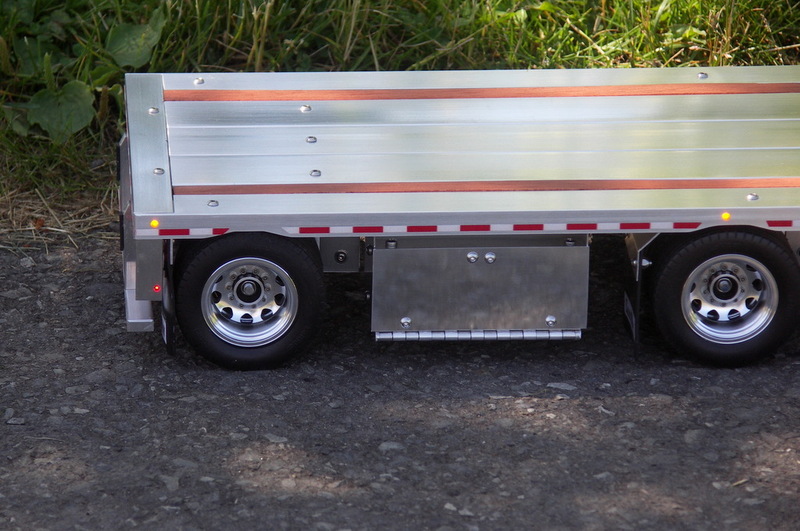 Introducing the new line of CoastWay trailers! 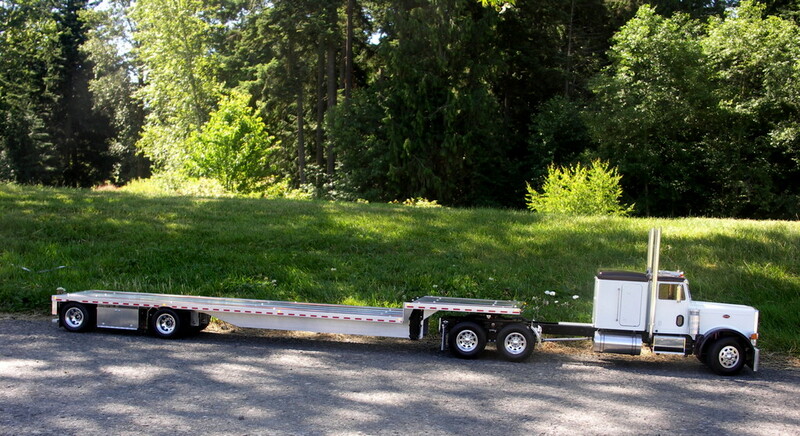 The new 48′ drop deck spread axle all aluminum flatbed trailer. They also come with aluminum tool boxes between axles as shown. 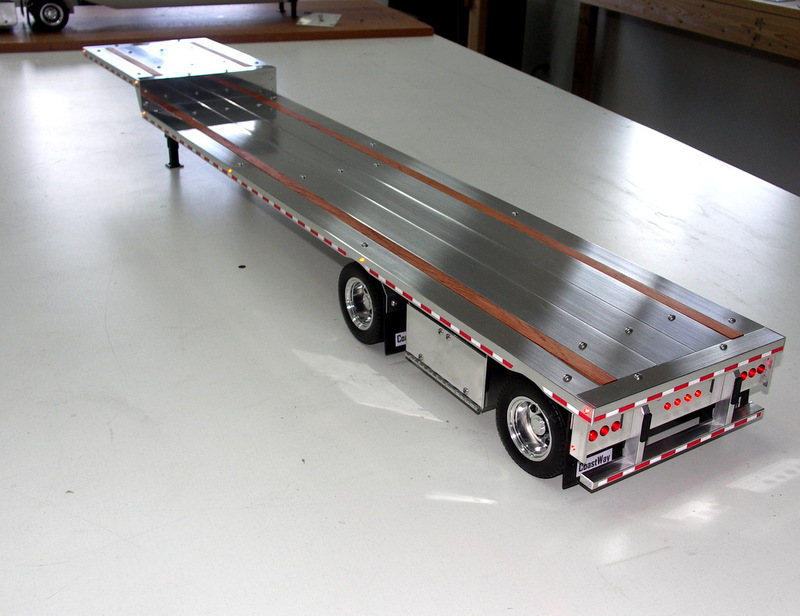 Measuring 43.25″ long, this trailer is ready for work! Tool boxes will also be available for the straight decks as well. My trailers now have a name, CoastWay Trailers. They are much more labor intensive than the flat deck trailers, but the end result is worth it. Email me for pricing and shipping costs, there is a wait as I have orders pending always a couple of months in advance. I take deposits to hold your place in the building queue. Great looking trailers, could there be more additional chicken lights added to the trailer, as well as multiple side boxes, along with side trailer pockets for stack sides and hooks for tarp roping or mini bunges. Plus the lightening, could that be wired into a plug to connect to a tractors lightening system for options of just park lights, turn signals, and brake lights? Thanks Wilfred, I will send you an email. Thank you for your interest, I sent you an email. How soon would a 48′ drop deck take to build? I sent you an email, thank you very much! Hi David, sending you an email. Thanks!! Hi Paul, I will send you an email. 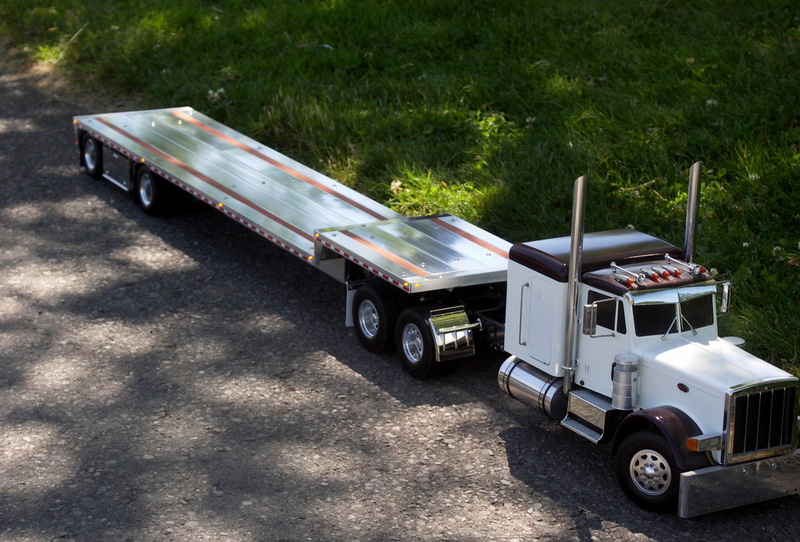 Am in the need of aluminum wheels for my semi tractor, do you sell those or who would you recommend buying from? Several types out there would love a set of 56509 Tamiya ones but they are no longer made. Thanks and by the way sometime later will be ordering a drop deck from you. Yes, you could pick up these up in person, if I have some available, but there is usually a wait list. No, I haven’t been to any shows, I can barely keep up now with real life always interfering! Thanks for the interest, I appreciate it. Thank you very much. What is the deal with Tamiya hitch you mentioned? Will your trailers go directly onto the tractors or does one have to modify the plate on the tractor? Thanks. Beautiful Workmanship You can build me a drop deck just like yours although I would like a few more lights entered between the lights you have on yours. I appreciate the compliment! I can do that, it will be awhile before I can get started, I have a several trailers waiting to be built once I am settled into my new place in early November. But absolutely, we can build what you want, more lights should be no problem. I will be contacting you shortly via email. I appreciate your past business and look forward to new business with you! Hi How can I order one of your trailers ? I really appreciate that Cory, I am happy you liked the trailer, it was a pleasure working with you!! I wanted to provide some information on scale since I just had a prospective customer ask why my trailers are the length they are compared to Garden Trucking flatbeds at 35″ long. 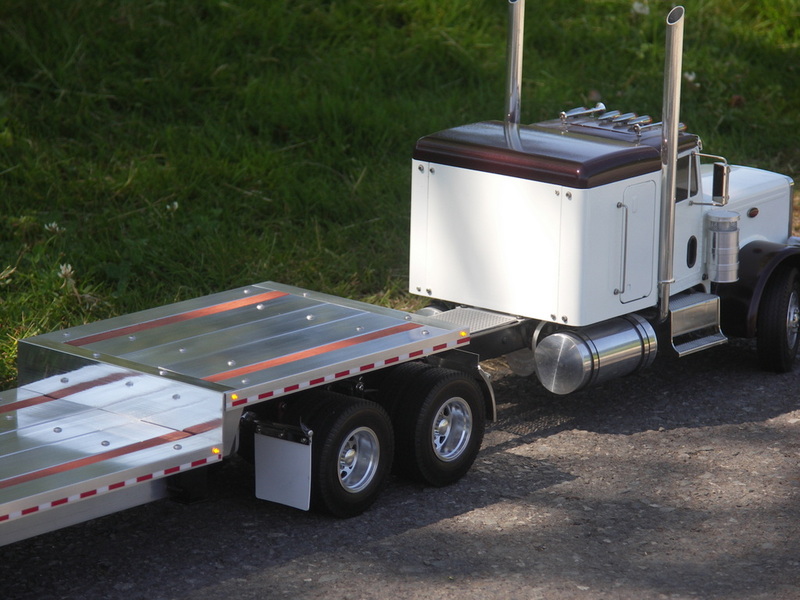 First Garden Trucking trailers are scaled after Wedico’s 1/16th scale. So they do not scale correctly to Tamiya trucks. My trailers are scaled on 1/13.5 which is the true scale Tamiya is at. Actually it is 1/13.47, I just rounded it up to 1/13.5. How do we know this? Well we know a U.S. tractor/truck measures 96″ wide. We also know Tamiya trucks measure 7.125″ wide, so divide 96″ by 7.125″ which equals 1/13.5. 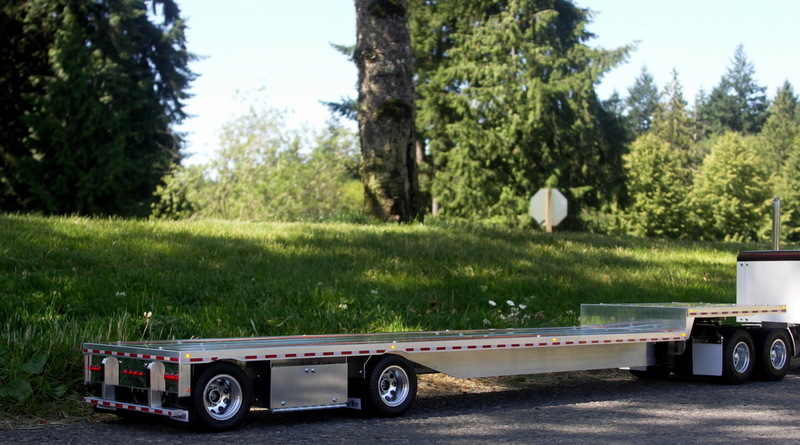 Now almost all trailers on the road today are 48(576″)long x 102″ wide. So 576 divided by 13.5 = 42.6″ long and 102″ divided by 13.5″ = 7.55″ wide. 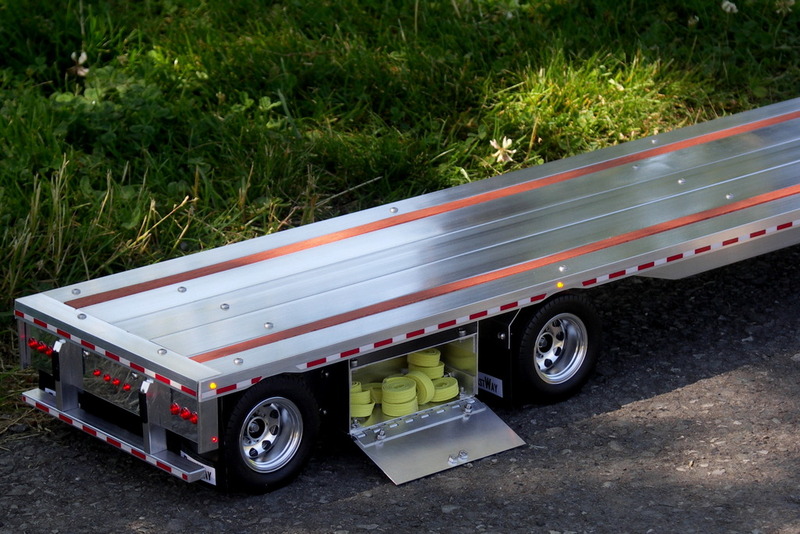 My trailers are right at 42.6″ x 7.55″ wide, which is correct scale for a 1:1 trailer which you see on the road today.